The 3 important things for a smoker is cigarette, lighter and ashtray. As a poker player and a smoker, the unbearable thing is that you lighted the cigarette, but nowhere to put the cigarette ash during the poker game. So a poker club or casino should provide the normal ashtray everything inside the room, and make the player and a smoker can enjoy the poker game freely. What is the best solution for the poker scanning camera which can put on the Texas Holdem poker table? The Ashtray poker scanner can be a good answer. And it stable scanning barcode function can make you to enjoy the poker game. As the ashtray is normally furnishing, nothing big deal if just put it on the poker table. As a poker player and a smoker, the ashtray can hold the ash, what else can do for a poker player? Yes, just use your imagination, the ashtray can also be a surveillance infrared poker camera, to help you check if there is any barcode marked deck on the poker table. In case there is any poker player cheat in the poker game. You may concern how the ashtray poker scanning camera works. How to insert the wireless spy poker camera into the ashtray for scanning the barcode marked cards. It it very simple, just need you to put the ashtray camera on the poker table in the right position to the marked playing cards, the ashtray can scan and report if the cards have been marked with invisible ink or not. 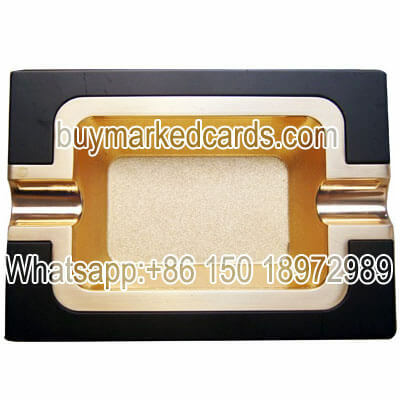 If there is invisible ink marked cards, the scanner can transfer the barcode mark to the poker analyzer directly. It a necessary an-ti poker cheating device for every poker players. And if you are a magician who is interesting in using this poker analyzer scanner to make a magic show, you can also check the video for the demonstration.